Denim, particularly in the form of jeans, is probably the most ubiquitous garment produced by the fashion industry. For an article of clothing invented as work wear, these pants have certainly become a global phenomenon, and for good reason. I thought it prudent to give some thought to just what makes these garments worthy of their longevity in the such a fast changing world. Let’s begin at the beginning, with the fiber itself. Denim is traditionally woven from cotton. Although there are innumerable inclusions in this day and age (see the tag on these cheap jeans I bought recently), higher quality denim is still 100% organic cotton. Although soft to the touch, cotton is an extremely durable fiber, which brings both comfort and longevity to your jeans. Cotton fibers have very little stretch, and are not prone to shrink in water. Hence you’re free to wash your jeans regularly, and they’ll retain their original shape for a long time. Although cotton generally absorbs dye well, fibers used for denim are often purposefully dyed to leave the center of the thread white. This allows for denim’s signature fade style: as the fiber wears away the white center becomes exposed. Once dyed, the cotton fibers are woven into a twill weave; The weft (side-to-side thread) passes over/under two or more warp (up and down) threads. The sequence is repeated one warp thread across, which gives the fabric it’s signature diagonal ridges as seen in the image below. Warp threads are also left white, which is why denim is a darker blue on one side than the other. This weave further contributes to denim’s signature fade; the diagonal rib gives the fabric a thicker consistency, and as the predominantly indigo outer threads are worn away the predominantly white inner threads remain, making the worn sections appear lighter than the surrounding fabric. Traditionally weft threads (the side to side ones) are thicker than warp threads, which is why the threads across the holes in your jeans run horizontally: they’re the thicker warp threads (originally dyed indigo, now worn away to their still-white core) which remain once the weft threads have worn away. Then it’s on to construction, with many jeans today sewn together with felled seams, which is a sturdier method of joining two pieces of fabric. Generally they’re also joined with a thick thread in chain stitch, which provides a bit of movement at the seams to avoid undue tension. These seams wear differently from regular seams, again giving jeans their unique fade. 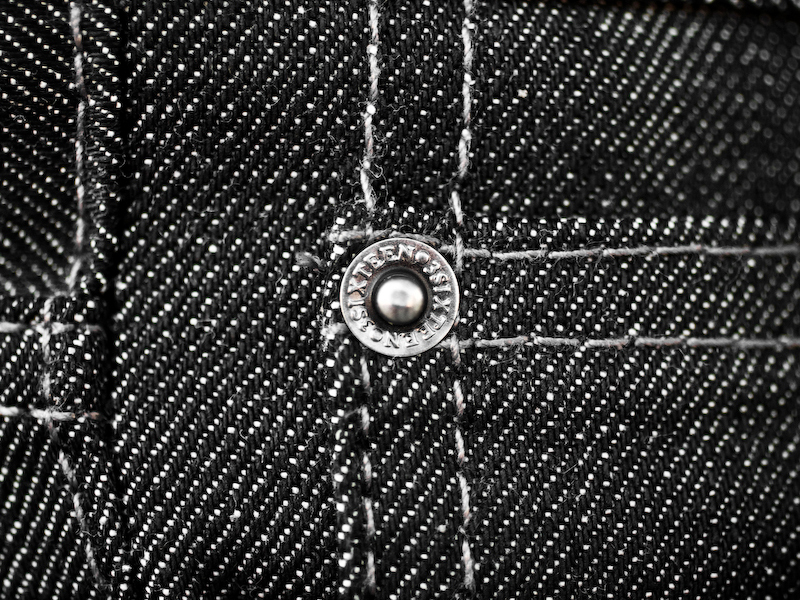 Finally, pocket edges are (in good jeans) riveted in place, or at least (in cheaper jeans) given a decent bar tack to strengthen these sections of the garment that get A LOT of action. I think the popularity of jeans is really in their ability to endure wear and tear, and still look reasonably decent, even if it’s in a grunge fashion sense. If you’re interested in what the hip brands are doing with denim, you can also check out my review of Nudie Jeans and their sustainable ethics.